The FileMaker Pro 7 datasheet became the template for many of the other marketing materials developed for this product launch. 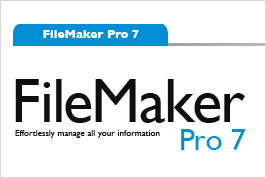 It succinctly lists the major selling points for FileMaker Pro 7, describes its benefits, and provides new messaging through the use of higher level, more aspirational language. Get up and running in minutes whether you want to manage a simple mailing list or a complex inventory tracking system. With FileMaker Pro 7, it's easy to create solutions that meet today's challenges and are ready for tomorrow's. Comes complete with 30 Starter Solutions that are ready to use right away. Import virtually any type of information including Microsoft Excel files, Access data, digital pictures, movies, and moreãno data entry required! Use the Layout and Report Assistant to guide you through creating layouts, labels, and reports so your screens and reports look just the way you want. When you're ready to expand, tap into the network of FileMaker users and developers around the world for tips, tricks, and ideas on how FileMaker can automate even more of your business. Instantly convert Microsoft Excel files to FileMaker databases for easy searching, sorting, and tracking. © 2004 Kevin Cobb. All rights reserved.